Effective face-to-face conversations are highly interactive. Participants respond to each other, engaging in nonconscious behavioral mimicry and backchanneling feedback. Such behaviors produce a subjective sense of rapport and are correlated with effective communication, greater liking and trust, and greater influence between participants. Creating rapport requires a tight sense-act loop that has been traditionally lacking in embodied conversational agents. 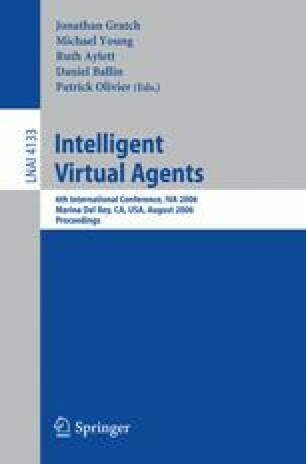 Here we describe a system, based on psycholinguistic theory, designed to create a sense of rapport between a human speaker and virtual human listener. We provide empirical evidence that it increases speaker fluency and engagement.